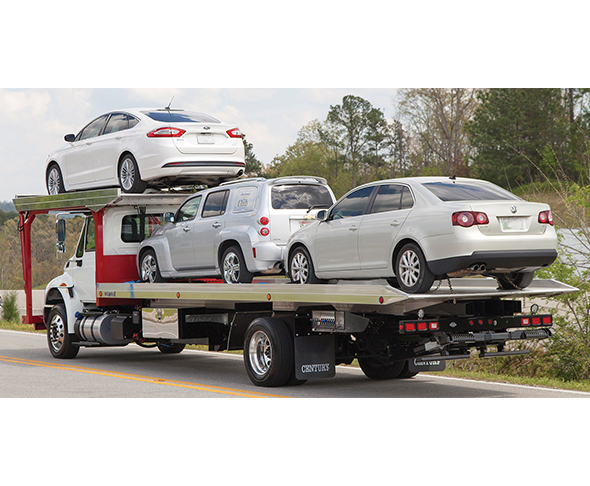 Century® and Chevron™ 20-Series aluminum 4-car carriers feature a unique 4” extruded double-boxed floor system with integral crossmembers every 2-3/4” to prevent torsion and bending within the body that can cause fatigue and cracking at the welds. Bed lengths are available from 28’ to 30’. The cab carrier comes standard with an 8,000-lb. planetary winch and optional air free spool function. Call 800-292-0330 or visit MillerInd.com.